New and improved formula, cares for your underarm skin like never before. 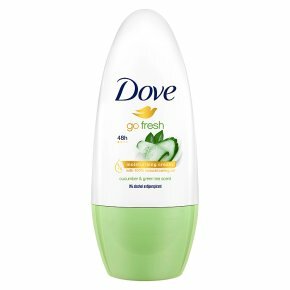 Dove Go Fresh Cucumber Anti-perspirant Deodorant gives up to 48 hours of confidence boosting protection. Contains our unique 1/4 moisturising cream for beautifully soft and smooth underarms. Helps delicate underarm skin to recover from irritation caused by shaving. Dermatologically tested and 0% alcohol formula. Fantastically fresh green tea and cucumber scent. Choose Dove Go Fresh Cucumber and Green Tea Anti-perspirant Deodorant Roll On 50ml to give your morning a burst of cucumber freshness with a soothing hint of sweet green tea. With up to 48 hours of anti-perspirant protection, you can carry the clean, crisp fragrances of cucumber and green tea with you all through the day. It?s new and improved formula, which is 0% alcohol, contains our unique 1/4 moisturising cream which helps delicate underarm skin recover from the irritation caused by regular underarm shaving. It?s our most skin friendly anti-perspirant ever, providing the reliable underarm care you know and love, helping your underarms to look and feel softer, smoother and even more beautiful than before. For best protection from sweat marks and skin irritation, simply apply the rollerball gently to each underarm after showering, preferably when your underarm skin is cool and dry. It glides on easily, so you simply need to use circular motions to get the best coverage, and enjoy underarm skin that feels beautiful and smells great. This convenient 50ml size is handbag/hand luggage friendly and perfect to keep you feeling fresh while on the go. New and Improved Dove Anti-perspirant, cares for your underarm skin like never before.